Enjoy the fresh air inside and out when you vacation at the North Myrtle Beach resort of Bay Watch Resort II because Bay Watch is a smoke-free resort. This large oceanfront North Myrtle Beach resort is easily spotted from a distance because it is a high-rise with a trio of towers and they are all on the oceanfront. Bay Watch II is along the Crescent Beach section of North Myrtle Beach, South Carolina. From Highway 17 you can find Bay Watch Resort as it is just a couple blocks from the main thoroughfare. This North Myrtle Beach resort features far more than oceanfront access. 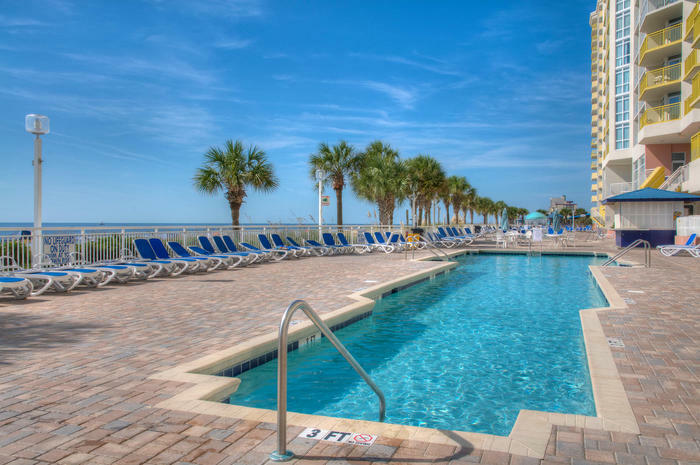 It is a North Myrtle Beach resort that is full of one-, two- and three-bedroom North Myrtle Beach condominiums that are perfect for your family North Myrtle Beach vacation. Most of these North Myrtle Beach condominiums have oceanfront views of the Atlantic Ocean and with an oceanfront balcony you will be spoiled each time you step outside. Fully furnished kitchens with dishwashers, high-speed Internet access, washer/dryer units, DVD players and more are generally part of the North Myrtle Beach condo rentals at Bay Watch Resort II. Sleeping from six to 10 people, these condos in North Myrtle Beach, SC offer space and amenities that you will love for your North Myrtle Beach vacation. On site at Bay Watch North Myrtle Beach Resort there are three pool decks, lazy rivers, hot tubs, game room, restaurant, sports bar, convenience store and fitness center. And nearby this North Myrtle Beach resort you can find the Cherry Grove Fishing Pier, numerous live entertainment theatres, championship golf courses, shopping, dining and Myrtle Beach attractions. It is all at your fingertips when you start your North Myrtle Beach vacation at Bay Watch Resort II. Elliott Beach Rentals is not affiliated with onsite management or the HOA of Baywatch 2.